According to a post on promoter Frank Maloney’s website, WBC president Jose Sulaiman has nixed the idea of a fight between his heavyweight champion Vitali Klitschko and former WBA champ David Haye of England. Both Klitschko and Haye have been chomping at the bit to fight each other, with Haye even announcing last week via Twitter that the fight was on. Now, in opposition to both fighter’s wishes, Sulaiman has thrown rhetorical cold water over the whole idea. “The WBC will not accept David Haye,” writes Sulaiman. “He is not rated by the WBC. And, The British Board of Boxing Control, can’t issue anything against someone who’s not affiliated to them any more. If he was licensed, he’d for sure have his license taken away from him. 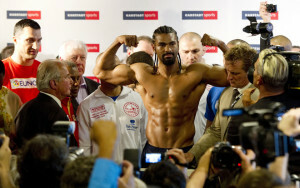 It would be setting a bad example for boxing if we accepted David Haye. Exactly who Sulaiman has in mind is the real question here. There are few if any other fighters in the heavyweight division who can sell a fight like the “retired” British motormouth, so for pre-fight publicity and resulting fan interest alone, Haye versus Vitali is a sure-fire world-wide winner–especially after the recent highly publicized post-fight brawl in Germany featuring Haye belting his UK counterpart Dereck “Del Boy” Chisora in the face. But Sulaiman isn’t having it. Some might say that the WBC president’s sudden worries about the image of the boxing are also a joke, but that is another story for another day.